Rarely have I come to a course expecting it to be a fine example of golf design, only to find it to be truly extraordinary. But that’s exactly the case with Yale, a Seth Raynor design that far exceeded my wildest expectations. It was whimsical, wonderful, occasionally confounding and always a hell of a lot of fun. That’s good golf. Raynor, an associate of CB Macdonald, created Yale in 1926. It was long considered one of the best courses in the U.S., but time and increasing tree coverage, were hardly kind to Raynor’s vision. 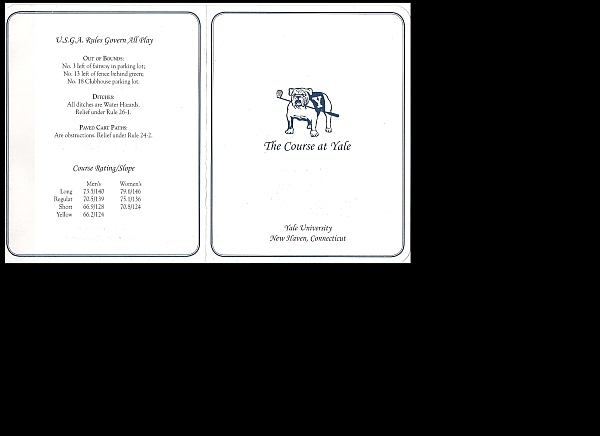 Thomas Dunne, my editor at the now defunct (and much missed) Travel & Leisure Golf, had joined Yale a few years ago. He’d urged me to make a stop at the course the next time I was in the New York area (the course is about 75 minutes from Westchester). Tom is an astute and critical observer of everything golf. If he suggested it was worth seeing, than a trip was necessary. It was nice to have him along for the round. The day began with a round at Quaker Ridge, the prestigious club in Westchester. During our round we ran into the superintendent who asked where we were headed next. When the reply was Yale, he displayed that he was clearly smitten with it. “You’re going to LOVE Yale,” he explained, his voice filled with the enthusiasm one usually reserves for his own course. We approached the club for our second 18 of the day. The clubhouse and parking lot are nondescript. The drive to the club wasn’t much better – a winding puzzle of middle-class houses that were largely indistinguishable from one another. But just as Pine Valley is hidden on the other side of the tracks, Yale’s course exceeds its surroundings. It doesn’t need million-dollar homes to set it apart – it has great golf. The opener at Yale provides a sense of the scale of the design. The first hole at Yale reveals two things – firstly that that difficulty isn’t from length (it measures 6,749 yards from the tips, where we played), and that the scale of the course, its width and the size of its greens, are basically without comparison, at least in North America. Everything is bigger than one would expect. Bunkers are deeper than anywhere else, and larger in size. Greens have greater movement and expand in unexpected ways. The Biarritz has a deeper dip in the middle and the Redan (is it a Redan, more on that later) has impressive slope. Everything is big and wonderful at Yale. It is golf that is impressive to look at and even more intriguing to play. The second hole, with its green that rises above a deep bunker that protect the right side, is a good example of this. The appropriate play is to lay back on the right, use the sloping fairway to propel the ball towards the centre, and then use the slope on the green to move the ball to the middle. However, the bunker looms over every approach, a central strategy that will be repeated throughout the design. It is proof that one doesn’t need dozens of bunkers to intimidate – just one nasty hazard will do. 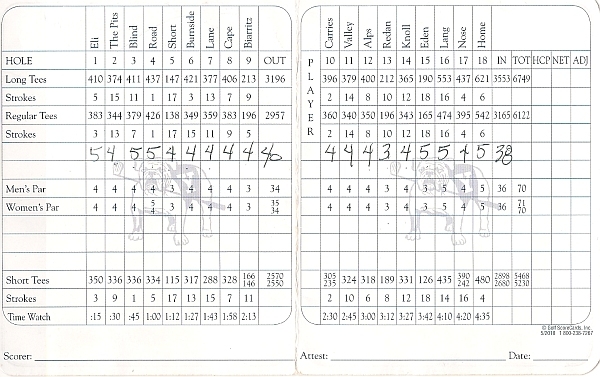 The front nine ends in a magnificent crescendo of powerful golf. From the seventh, a mid-length par-4 with a green set high up a steep slope, and the eighth, a Cape hole with a remarkably deep bunker on the right and an incredible green, and the climax, the Biarritz at 213-yards, is as good a finish to the first nine holes as one can expect to find anywhere in golf. Shockingly, Raynor ups the difficulty on the back nine, which opens with a 396-yard par 4 that plays to a head shaker of a green. Some might consider the hole too difficult, especially when one finally witnesses the green, which rises some 40 feet above the fairway. It is one of the more unusual holes I’ve ever seen, and I’m torn between praising its design and wondering whether the typical bogey golfer would simply find the approach shot overwhelming. Thankfully, Raynor presents a reachable, downhill par 4 for the 11th, but then amps up the difficulty with the most challenging Alps hole I’ve seen. The Alps is patterned after its prototype at Prestwick in Scotland and features a blind approach over a hillside to a green that is bunkered in front and to the left. True to form, Yale’s Alps is a 400-yard monster, played to a green protected by deep bunkers and featuring a green that slopes firmly to the right. The 12th is the Redan, one of the template holes Raynor and Macdonald always turned to. This one is decidedly downhill, with a steep slope on the back and right. However, a typical Redan would propel a well-hit shot towards the back left, while this green kicks balls to the front right. It may or may not be a Redan, but it is a great hole, one of the best one-shot holes I’ve seen. The other par-3 on the back, the Eden, is similarly excellent. The great holes end at 17, a nasty long par-4 to a dramatic double-plateau green that falls off steeply on the left. The 18th, an odd par-5 where the second shot plays over a steep hillside, is odd, though not off-putting. Legend has it that Raynor ran out of cash and couldn’t finish the hole properly. For me it didn’t matter. As we finished in the gloaming, and walked towards the parking lot, I recognized Yale is one of golf’s great courses and experiences. How this one isn’t Top 50 in the world is beyond me.